It’s week three of our fall color reports for the North Carolina mountains and fall’s colors are starting to reach our elevation at 2,300 feet near Black Mountain and Asheville! As color descends from elevations above 4,000 feet, this is the week for yellow hues, as birch, beech, hickory, some sassafras, white ash and more start lighting up the ridges near the Inn. In addition to the golds, the reds of sourwoods, dogwoods and sweetgums provide a nice accent. There are two ridges that flank the Inn: Bernard Ridge to the east and Horse Ridge to the west. 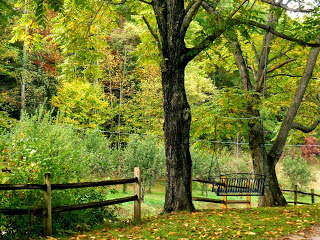 Bernard Ridge is always the first to change because of the types of trees on it, but Bernard Ridge is now getting into the game and makes a nice backdrop for our apple orchard. The Orchard at Altapass: Take a pretty drive on Highway 70 east to Highway 221 North to reach the Blue Ridge Parkway, which remains OPEN despite the federal government shutdown. Then travel south on the Parkway to the Orchard at Altapass. [A nice overlook along the way is the Chestoa View overlook at Milepost 320. At the parking area, take a set of stairs to the right down to a gorgeous stone wall overlook that shows off Linville Gorge.] The historic Orchard at Altapass is at Milepost 328.3 in Spruce Pine. The Orchard is more than just apples: They feature hayrides, music on the weekends, fudge, and more. It’s a great little piece of mountain history, with beautiful mountain views all around. 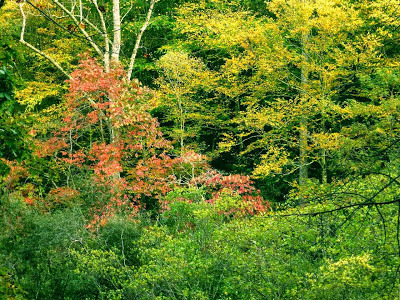 The Blue Ridge Parkway near Grandfather Mountain: The tree species at Grandfather Mountain are quite diverse, making it one of the most colorful areas this time of year. The best time to visit Grandfather Mountain is in the middle of the week as Saturdays can bring delays in getting through the gates. 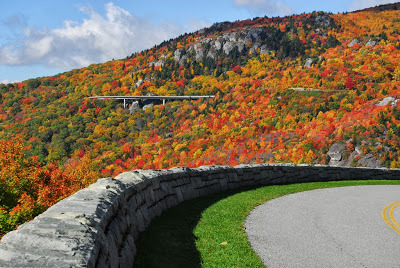 If you want to explore the Blue Ridge Parkway around Grandfather Mountain, take Highway 221 then head north on the Parkway, which will take you around Grandfather via the Linn Cove Viaduct at Milepost 304. 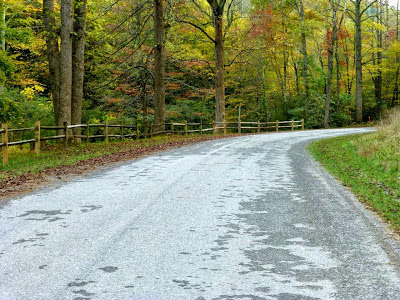 Mount Pisgah: At Milepost 408 along the Blue Ridge Parkway south of Asheville is Mt. Pisgah. Named for the mountain where Moses saw the promised land, North Carolina’s Mt. 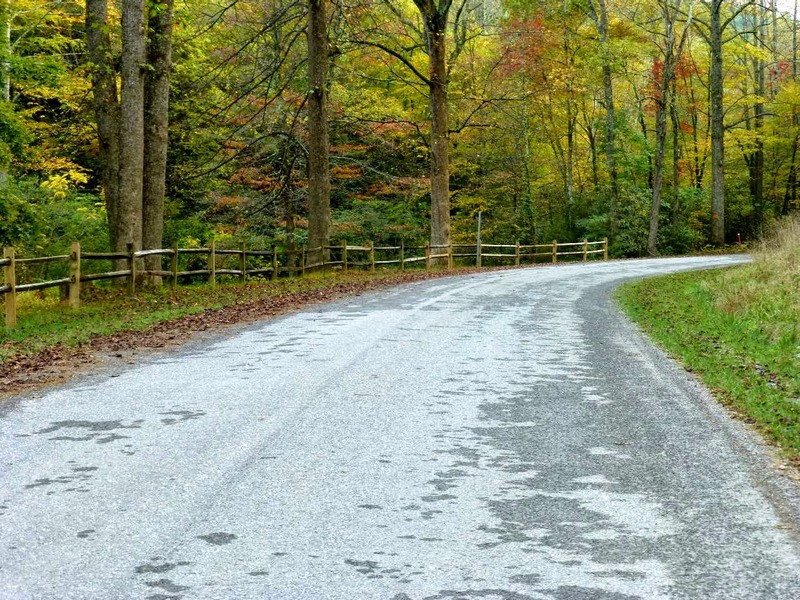 Pisgah is over 5,700 feet in elevation and a prominent part of the Asheville landscape. George Washington Vanderbilt enjoyed a view of Mount Pisgah from his bedroom at Biltmore Estate. In fact, Mr. Vanderbilt owned the land around Mount Pisgah and constructed the 16.5-mile Shut-In Trail (still a trail to this day) from Biltmore to his retreat at Mt. Pisgah called Buck Springs Lodge. For a shorter hike with stellar views of Cold Mountain, Shining Rock Wilderness and more, our friends at HikeWNC have a great description of the hiking trail to the summit of Mt. Pisgah.